Potter Laura McCrossen studied her craft at Bath Academy of Art, graduating in 1988. She spent the next six years working in potteries all over the UK and Ireland, honing her skills and practice and developing her inimitable style of throwing and decorating ceramics. 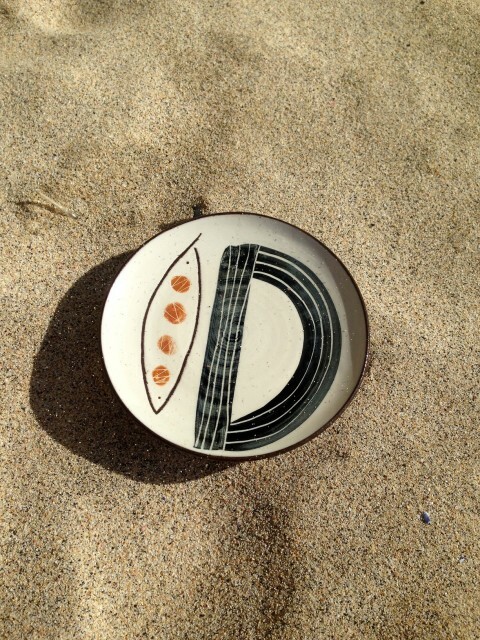 In 1994 she set up the Fish Pye Pottery, located on Back Road East in the artistic hub of St Ives, a literal stones throw from the crashing surf of PorthmeorBeach and bathed in the world famous iridescent light that has attracted so many artists to this tiny town perched on the extreme South West of Britain. Since beginning Fish Pye she has been continuously potting and selling her work direct from the studio with great success and admirable longevity. Laura makes high fired earthenware using red clay – this is earthenware fired at a significantly higher temperature than normal, making the resulting piece less porous and more durable - veering towards stoneware but still with the distinctive warm look of earthenware and using the lovely red clay that characterizes her work and sits strikingly alongside her glazes. She works in the decorative tradition of English slipware, using motifs that are simple and abstract, echoing the shapes of nature and using a limited palette that complements the warm red of the clay, a panel of which is always left unglazed.